When enjoying the comfortable and fresh air, can you think there is a HD detective camera inside the air purifier? But it really can record people's every move. And every illegal act will not escape the eye of the Hydronium Air Purifier. This is a high class Hydronium Air Purifier. Actually, there is a pinhole camera set internally, so it is also a spy camera. It can record everything as your instruction. This product has no difference with the ordinary Hydronium Air Purifiers, so it has good disguise. Moreover, the function of cleaning the air is retained. You can put it in the bathroom and use it to clear the air. This helps you improve life quality. As a fantastic hidden camera, the quality of camera is quite momentous. To make sure the shooting quality, the resolution of the camera is up to 1280X720. And for the sake of increasing the shooting hour, there is a high capacity lithium battery and a 16GB memory card built accompanied with the camera, so the hidden camera can work 8-10 hours for one time. Without doubt you can get long hour good quality videos from this high-tech product. This product is suitable be used in a lot of places, such as hotels, homes, offices, meeting rooms, factories, hospitals, fitness and entertainment centers, bathrooms, waiting halls and so on! 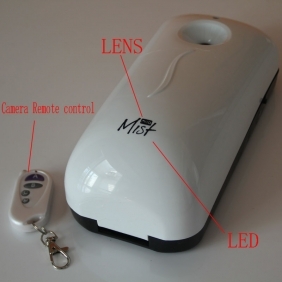 The Hydronium Air Purifier Camera （EY-PSC012）is a professional detective waterproof pinhole camera. Its hidden camera installation makes the shooting work more secret. To make the camera operation faster and more convenient, there is an external remote controler. You can record everything you want quite easily. Another characteristic of this product is its motion detection. In order to better protect the buyer's benefit, before buying a professional bathroom spy pinhole camera, please read the introduction of the product and have a look at the video demonstration sample provided bybathspycamera.com Please contact us for more information about this product.